RoboRally now classic tactical game with different levels of difficulty and game board cool robots. 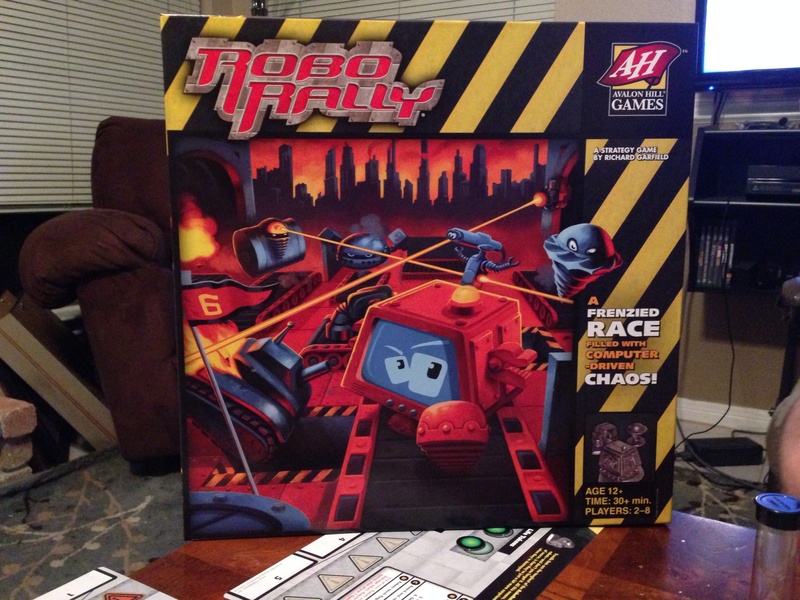 RoboRally is a board game originally published in 1994 by Wizards of the Coast (WotC). It was designed in 1985 by Richard Garfield, who would later create the card game Magic: The Gathering. The game and its expansions received a total of four Origins Awards. RoboRally was rereleased in July 2005 under the Avalon Hill label. In RoboRally, players assume control of one of many “Robot Control Computers” in a dangerous widget factory filled with moving, course-altering conveyor belts, metal-melting laser beams, bottomless pits, crushers, and a variety of other obstacles; the concept is that this is what the control computers do for fun after hours. The goal in a game of RoboRally is, apart from survival, to be the first to reach a pre-designated number of checkpoints in a particular order. However, the real difficulty in RoboRally is movement, which is accomplished with the randomly dealt program cards. Good planning the movements of other robots also have to predict because they change each other. However, the thrill just from the fact that nobody knows the future is. In RoboRally player’s each control a different robot in a race through a dangerous factory floor. Several goals will be placed on the board and you must navigate your robot to them in a specific order. The boards can be combined in several different ways to accomodate different player counts and races can be as long or as short as player’s desire. The program cards specify movement, such as move one space forward, turn left or U-turn. The cards have to be arranged by the player in the specific manner they wish the robot to move. Each player receives up to nine cards each turn. They use five of the cards to specify their robot’s movement for the given turn, playing each card face down into one of five available “registers”. All robots move simultaneously, each player revealing each register in turn. The game embodies an inversion of the concept of computer simulation games: rather than a computer simulating some real world action, human players simulate the actions of computers. The basic game includes six different boards, which allow players variety of play as well as the ability to alter the length or difficulty of games. The recommended ages for RoboRally are 12+, but we know younger kids will want to join in the fun too. Those cool robots are too fun to pass up.